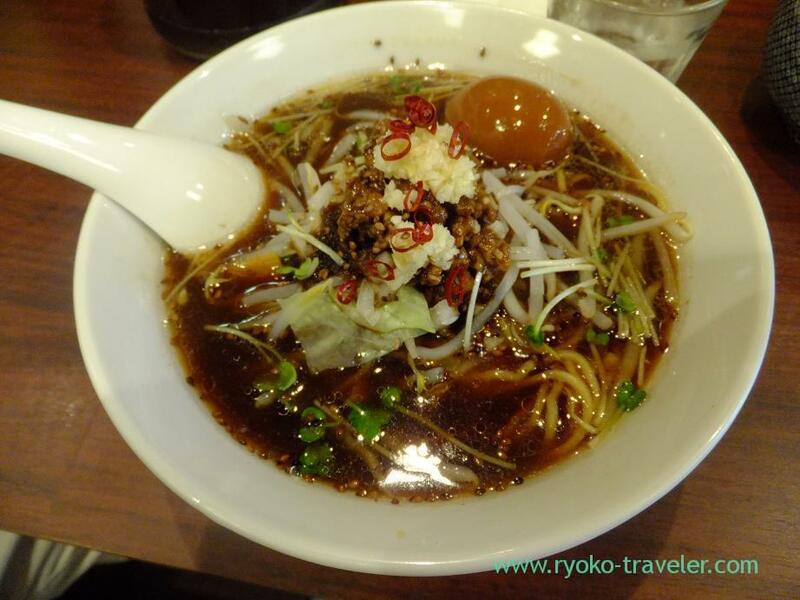 What is Funabashi sauce ramen ? I had known only its name. The name is “Funabashi sauce ramen”. Some ramen shops serve their original worcester sauce flavored ramen for a limited time regularly. Each ramen shops invent own “Funabashi sauce ramen” and serve. I had ever eaten salt ramen, soy sauce ramen, miso ramen and tonkotsu ramen. I had wanted to eat it for a long time, but I didn’t have the courage. My friend invited me to eat it at the ramen shop near Funabashi station. So, I went to the shop to eat Funabashi sauce ramen with my friend with curiosity. Yes, “Funabashi sauce ramen” ‘s “Funabashi” is name of the city. In Funabashi Station surroundings, restaurants have formed the Funabashi Society for the Worcester sauce Ramen to revitalize the town by advertising it as ‘where worcester sauce was first included in the ramen. The moment it came to me, there was a smell of heated worcester sauce. Sour smell. Cabbage, sprouts of white radish, bean sprouts, red peppers, grated ginger, pork miso and boiled egg with soy sauce on it. And sesami was swimming. The color of the soup was very thick. I had a conviction before eating it. At first, I felt it was not bad. But the more eating it, the more sourness storing in my mouth. I couldn’t eat up. I gave up. I think the day will never come that the worcester sauce ramen join standard flavors. But some people ordered it, too. Certainly, it is a hot topic.